The New Year is always pitched as a time to make resolutions and become a healthier person. Usually this includes adding some sort of exercise routine to your schedule. There’s no reason why that shouldn’t apply to the felines in your world, too, right? Check out these six videos of cats getting in shape for the New Year with a little help from their exercise wheels. When hitting the circular treadmill, this intrepid cat athlete always makes sure to look dashing in a sporty pink sweater. Does your cat need a little encouragement to start pounding along on her exercise wheel? A tantalizingly placed feather toy can be quite the motivator! Remember, starting an exercise regime can be a big commitment and it is important to keep at it, even if your first kittenish steps don’t exactly go according to plan. 4. Don’t Be Afraid To Improvise! Exercise needs to be something you enjoy or get a kick out of, so feel free to think outside the box and come up with your own special routine, just like this Bengal here. Another way to stick to your exercise routine is to join up with friends and get a little sweaty together. Check out this clowder of cats enjoying some multiple exercise wheel action! 6. Sometimes Quitting Is Okay! Finally, remember that it is okay to give up on your dreams of ever catching the elusive red laser dot. Some things are just not worth the effort. 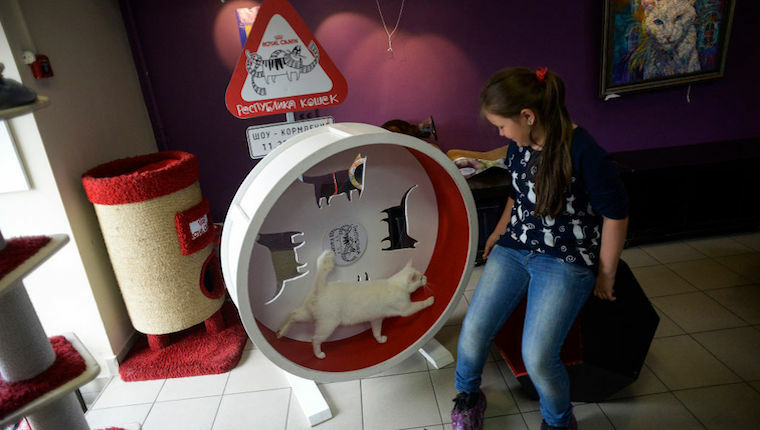 Does your cat get to enjoy an exercise wheel? Tell us all about it in the comments below!